There might be a new trend brewing among houses for sale in Tallahassee, FL. I promised to be vigilant in monitoring the listings of foreclosures, short sales, and bank owned properties, and they appear to be on the rise again. Every day we track the new listings of houses for sale in Tallahassee, FL priced above $100,000. This allows us to focus primarily on the non-investor segment of the market for the purpose of seeing how most owner-occupants are faring in their attempts to sell a home. Unfortunately, it appears a new trend among houses for sale in Tallahassee, FL is showing a rise in troubled home sellers. We have monitored the shadow inventory of real estate in Tallahassee for many years, and we know there are thousands of homes remaining that must clear the market. This "pent-up" supply of homes could put a major damper on the housing market recovery if they all entered the market at the same time. Note: Today is my mother's birthday. If you happen to know Mary Lou Manausa, don't forget to wish her "happy birthday." Happy birthday Mom! Thus far, the news has been good in that new supply was coming into the market at a slower rate than the increase in demand, and until just recently, the trend showed a decline in distressed houses for sale in Tallahassee, FL. In the real estate graph below, we measure the thirty day trend of new listings of houses for sale in Tallahassee, FL priced above $100,000. 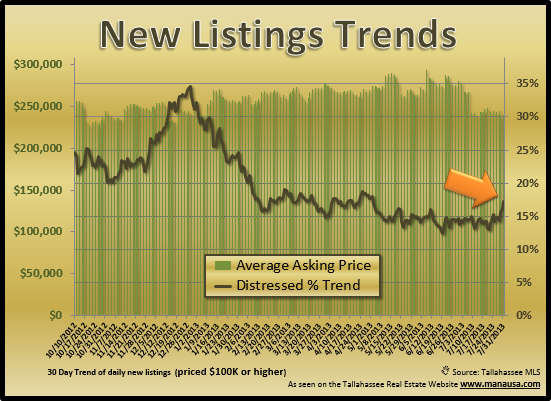 The green vertical bar shows the average asking price, while the brown line shows the percentage of distressed homes for sale versus all the homes for sale. By measuring the short term trend, we get a good feel for changes in the Tallahassee real estate market inventory as they occur. By using a short-term trend, real estate seasonality could very well be a factor. The spike in the graph shows a lot of distressed homes for sale in Tallahassee, FL entered the market at the end of 2012. But almost immediately after that, we started seeing the decline in short sales, foreclosures, and bank owned properties. Unfortunately, if you follow the orange arrow at the right side of the graph, there has been a spike in the past 10 days. Hopefully, we'll see this fall back down, but it very well could be cause for concern for present and future home sellers if we see the trend continue. A rise in distressed properties almost always is followed by a decline in home values. If you want to know what your home is worth and how it will be affected by similar houses for sale in Tallahassee, FL, just drop me a note and we can schedule a time to review your home's value and the options that you have today.